If you ever wish you could be on your quadcopter when you fly it, you will really want to see the video showing the Dubai police department testing the Hoverbike. The Russian company Hoversurf that markets the device doesn’t provide a lot of technical details, but it looks fairly simple. It is basically a motorcycle seat along with a big quadcopter. From the videos about the device, you can deduce that the pilot can control it or you can fly it remotely. You can see one of the videos, below. There are a few things that worry us here. Of course, the huge spinning propellers as the pilot’s knee level should give you sweaty palms. In the demo, they even show the removal of the propeller guards before the test flight but let’s be honest, those don’t look like they would keep a falling pilot out of the rotors at all anyway. When looking beyond the hype we find it curious that the demo doesn’t show many (if any) shots of the pilot making a turn. The benefit of a vehicle like this to police should be maneuverability and from what we saw the Hoversurf is still limited. So is it real? Hard to say. The short videos mostly show vertical or horizontal flight with no maneuvering. Is it hard to turn? Is the battery life really short? One other oddity: When we first saw a letter from the US Patent Office on their site, we thought they might have some new technology. However, that letter is simply showing they registered a trademark and doesn’t reference a patent. If there is a patent we want to know what is new and novel here. Of course, we know it’s possible to build such a machine since we saw [Colin Furze] do it with two rotors instead of four. The US Department of Defense is working on something with a company called Malloy and there are other practical examples. There are also some less practical examples. What we’re really on the lookout for is a product that works so well it will actually be used. You know, like those Segways that airport police use, right? We hope Hoversurf can bring this to market because we definitely want one. There’s no reason to think they can’t, but we do wish there were more details forthcoming. We’ve all seen the stories about IoT devices with laughably poor security. Both within our community as fresh vulnerabilities are exposed and ridiculed, and more recently in the wider world as stories of easily compromised baby monitors have surfaced in mass media outlets. It’s a problem with its roots in IoT device manufacturers treating their products as appliances rather than software, and in a drive to produce them at the lowest possible price. The Australian government have announced that IoT security is now firmly in their sights, announcing a possible certification scheme with a logo that manufacturers would be able to use if their products meet a set of requirements. Such basic security features as changeable, non-guessable, and non-default passwords are being mentioned, though we’re guessing that would also include a requirement not to expose ports to the wider Internet. Most importantly it is said to include a requirement for software updates to fix known vulnerabilities. It is reported that they are also in talks with other countries to harmonize some of these standards internationally. It is difficult to see how any government could enforce such a scheme by technical means such as disallowing Internet connection to non-compliant devices, and if that was what was being proposed it would certainly cause us some significant worry. Therefore it’s likely that this will be a consumer certification scheme similar to for example the safety standards for toys, administered as devices are imported and through enforcement of trading standards legislation. The tone in which it’s being sold to the public is one of “Think of the children” in terms of compromised baby monitors, but as long-time followers of Hackaday will know, that’s only a small part of the wider problem. Thanks [Bill Smith] for the tip. Baby monitor picture: Binatoneglobal [CC BY-SA 3.0]. People talk about active and passive components like they are two distinct classes of electronic parts. When sourcing components on a BOM, you have the passives, which are the little things that are cheaper than a dime a dozen, and then the rest that make up the bulk of the cost. Diodes and transistors definitely fall into the cheap little things category, but aren’t necessarily passive components, so what IS the difference? They say that if something is worth doing, it’s worth doing right. Those are good words to live by, but here at Hackaday we occasionally like to adhere to a slight variation of that saying: “If it’s worth doing, it’s worth overdoing”. So when we saw the incredible amount of work and careful research [Rob Linnaeus] was doing just to roast coffee beans, we knew he was onto something. 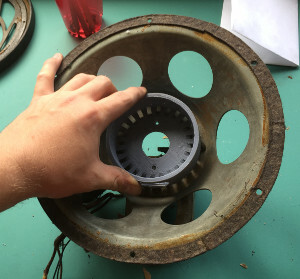 The heart of his coffee roaster is a vortex chamber with an opening on the side for a standard heat gun, and an aperture in the top where an eight cup flour sifter is to be placed. [Rob] modeled the chamber in Fusion 360 and verified its characteristics using RealFlow’s fluid simulation. He then created a negative of the chamber and printed it out on his Monoprice Maker Select 3D printer.